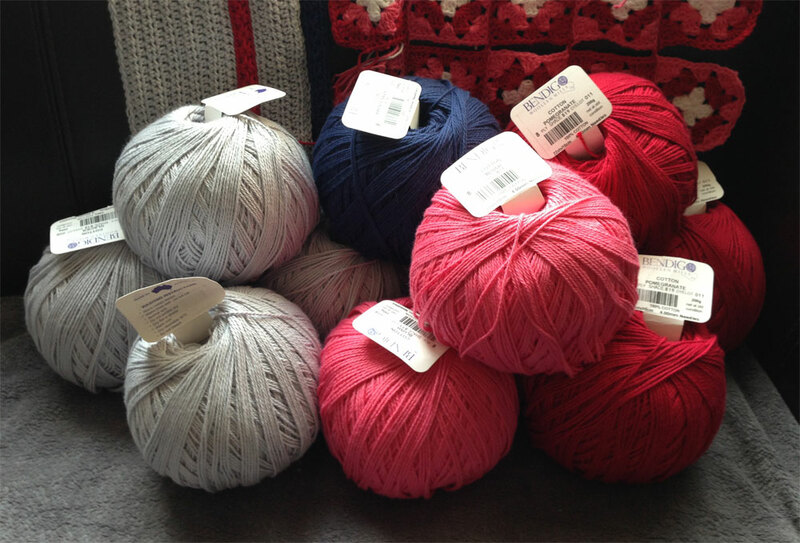 The new yarn from Bendigo Woollen Mills has arrived! Although I posted that I was going to order it straight away, I didn’t. Doing two blankets at once meant that I had to put in an extra large order for yarn which also meant a larger cost. It made me nervous, I don’t like spending too much money on my yarn habit. Saying all that, it was still very cheap (in my opinion) considering the quantity and quality. Plus once those lovely balls arrived I was so excited! The grey, blue and red will be used for the Mr Stripes blanket and the pink and red will be used for the Strawberries and Cream blanket. Hopefully now I will have a finished blanket to enjoy and share. This entry was posted in Blankets and tagged Bendigo Woollen Mills, blanket, crochet, Crochet Missy, Mr. Stripes, Strawberries and Cream, Yarn. Bookmark the permalink. That looks adorable, and I’m more than a little jealous! I’ve never really used any yarn from Bendigo Woollen Mills – those colours look wonderful. Don’t they! It is the only yarn that I work with at the moment. Mainly because I have found a good thing and don’t want to risk wasting my money on anything else. That may change one day. New supplies, what a treat! I have a self imposed ban. I probably have enough WIPs to see me through the summer. It is a treat, not one that I allow myself very often. It is always good to have lots of WIPs handy though. At least when you are bored of one thing you can move onto something else. Yes, I think they are lovely. Lovely colour selection. Can’t wait to see the blankets. Thank you. This new pile of yarn should ensure my motivation keeps up. I didn’t even have to read the first line as soon as I saw those balls of yarn I knew they were Bendigo Woollen Mills. I love their stuff. The cotton is great. I’ve used their 100% wool that is machine washable so can recommend those if your ever need wool. That is great to hear. I keep thinking that I should buy some of their wool but it is easier to go with what I know. One day. The cotton states that it should be hand washed but I wash all my cotton in my front loaded and have never had any problem. The blanket has even made it through the dryer without issue! I have just checked out your blog and it is fabulous. Some of the food is making me very hungry!